Hi, my name is Rick and I am the Shihan (Instructor) of the Rembukan Dojo. Over the years we have revamped, rewritten and re-launched our website many times. Each time we hope to make improvements. One of our goals however is to be informative and to offer a repository about the Japanese Budo that we have selected dedicated a good portion of our lives to study. My first footsteps as it were started in Milwaukee, WI in a karate dojo when I was twelve. I can attribute my graduate studies, my wife and family and many of my closest friends to this study which has now spanned more decades than I care to count. Despite my best efforts, I haven't yet walked very far in learning let alone mastering these wonderful martial traditions - no matter, I'm in it for the long haul. I've been fortunate over the years to have been on the mat with some incredible teachers and seniors, many of whom will be discussed within this website. Besides ease of navigation, accuracy of content, and information for members, this site is now so much more! I'm getting older if not wiser and now that I look back on my journey I realize that I have a story or two to tell. It is an ideal conduit because you, the reader can choose whether to engage or not. I'm very proud of the students that have continued to train at the Rembukan Dojo. You have not only demonstrated that you are terrific human beings but also great exponents of these ancient martial traditions. Their efforts make the dojo a breathing living place and you have enriched my life and touched the lives of my family. I appreciate sharing the mat with you. Perhaps you will have stories to add - I hope so. As to who we are? Well we're an interesting mix of adults, mostly male though we would happily encourage more women to practice these arts too. We have an incredible array of talent within our group with impressive accomplishments both personal and professional that could be boasted about but none do. Ranks, competitions and trophies are not really a big part of our Koryu traditions. Everyone simply strives to improve their skill sets. Everyone realizes that we'll never truly complete the task, and everyone makes effort. I had been studying karate for almost 10 years when I met a policeman while at college that was a judoka. Thru a special police course, Officer Bruce Brown traveled to Japan to train exclusively and began formal instruction in Shindo Muso Ryu as well as other budo. Upon my graduating University Bruce invited me to Japan and sponsored my entrance. 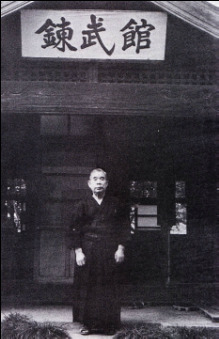 It was there that I first met many of my teachers including Shimizu, Draeger, and Kaminoda Sensei. I could not imagine then what a profound effect it would have on my life or that one day I would be in some very small way trying to promote Shimizu Sensei's vision for Jodo to have a global stance. He thought that practicing Jodo was not only good for physical health but for mental health as well and saw Jodo as a gift to be offered to people everywhere.